Practicing freestyle fencing with John who wielded Chinese military Dadao. A tutoring session with DS 2.0. Excuse me, Lancelot, I am very curious: what are Realistic Sparring Weapons made of and how were they put together? I have never seen practice weapons like them anywhere else and I wonder what caused you to make your trainers the way that you did? 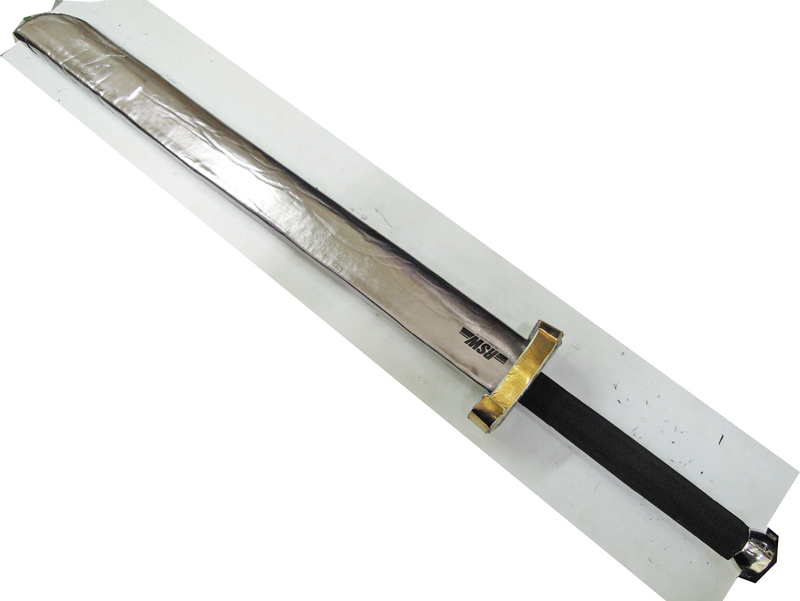 RSW were padded sparring swords that feature weight and balance of the real swords they simulate. They were made of foam, fabric, plastic, aluminum, steel, wood, nylon and rubber. We assemble them at my place here. We made them because in Hong Kong it's very hot and we don't want to melt down ourselves with plenty protective gears. With RSW you only need a helmet with face protection and finger protection, then you can go full speed sparring with something handling just like the real sword (same weight and balance). In addition it allows more freedom of movement and a free choice of targets without worrying that hitting somewhere not armored up. Also, there were techniques in some martial arts better practiced with RSW than with blunt steel, like Chinese Fajing. And some swords were better off sparring with RSW than with blunt steel too. 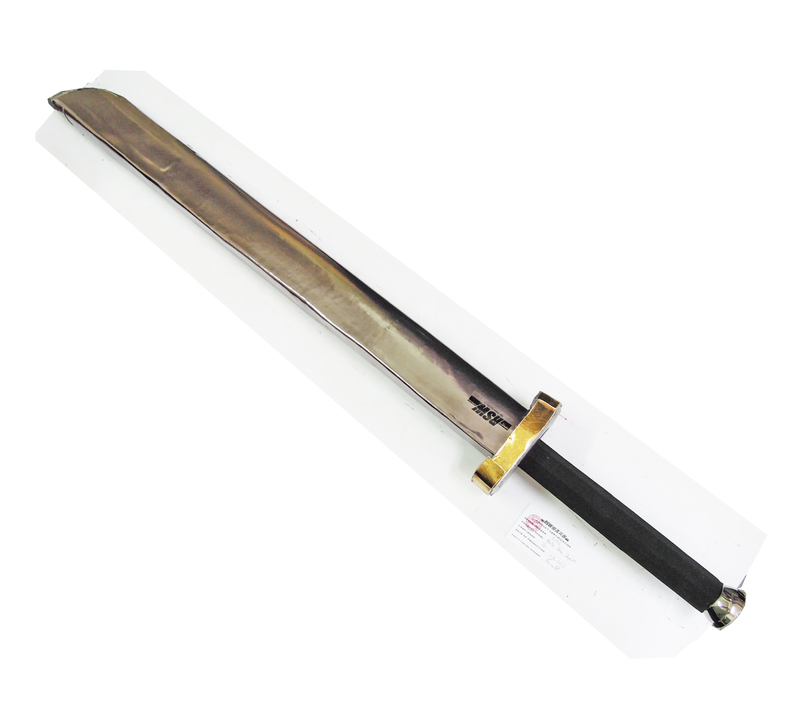 For example, some Chinese war swords are quite heavy and relatively forward balanced, and would not be safe at all to spar with blunt steel. Sparring with Yip, who was a local sparring contest champion and practices Iaido. Sparring with Rico, a visitor. Freestye Fencing with our epee fencer friend Ross Gascoigne, who wielded a rapier and try it out. Those are survival rate, not hit rate. So it's not likely to be 100% in total since a few double kills occurred. Freestyle fencing with our Taiwanese friend Ji Gang, who practices sports fencing. Freestyle fencing with French visitor Jean Luc Ancelin who wielded with single sword + dagger. Freestyle fencing with French visitor Jean Luc Ancelin who wielded with rapier + dagger. My student Dung vs Jean. Freestyle fencing with a twin Chinese dao friend. Freestyle fencing with advanced student. ... and yes, ladies that includes you too. Just find yourself one of the female versions. Freestyle fencing with a student who studied in mainland China. He then also sparred with another student. Freestyle fencing with a long time good friend, since 7 years ago. Freestyle fencing with intermediate student Taku in modern material armor, taken as their actual protective value. Grey spot means the attack was defended by the armor. Our armors were not totally sword proof as historical armor was, so good solid hits would likely to still have some effects, while the finer hits would be fended off by the pieces. Student test cut practice, the third bottle was "armored up" by a dog-toilet plastic plate. Lancelot, I appreciate watching all of your videos and mostly sending a reply since few seem to comment on them. With armoured combat, the armour can be used to make all out power to be used safely in simulation non armoured fighting or can be used trying to use in armour combat techniques meaning that with swords in particular effective fighting would mean a lot of half swording and having to close into wrestling and the use of a rondel dagger. I also notice that it's difficult to use a lot of " play at the sword " for more subtle techniques, a lot depends on timing one's attacks and controlling distance/measure. One aspect which makes interpreting and understanding the action difficult, is that after a theoretically deadly and successful hit, the " loser " will still hit the winner because, to be realistic, the loser isn't really wounded or dead or incapacitated and can still hit you back .... also at the speed of the action the " loser " of the exchange just doesn't have the reaction time needed to " abort " his almost simultaneous attack or riposte. One thing to try to keep in mind tactically would be to defend successfully from this counter attack by creating distance right after the hit or still concentrating on parrying: In a real fight, these " after attacks " can still happen as the opponent is rarely stopped instantly unless decapitated or seriously dismembered ..... in training and sparring a counter attack is almost unavoidable I think and has to be factored in when judging who won each exchange ! I must admit, that I rarely can see, or be sure who won just looking at the action, as it happens so fast and one would almost have to see it from multiple angles, or be there to feel the hits or misses and the time intervals between the successful winning hit and the almost simultaneous return blow by the " theoretical loser ". In any case your videos are interesting and I'm sure at the speed you guys are going the extremely small units of time between hits and parries/responses make it hard to be exhibits of " pure and theoretical " fencing techniques.